Lieutenant Junior Grade Tetsuzō Iwamoto (岩本 徹三 Iwamoto Tetsuzō) was one of the top scoring aces among Imperial Japanese Navy Air Service (IJNAS) fighter pilots. He entered the Imperial Navy in 1934 and completed pilot training in December 1936. His first combat occurred over China in early 1938. He emerged as the top ace of the Imperial Japan during WWII, credited with at least 87 aerial victories including 14 victories in China. Subsequently, he flew Zeros from the aircraft carrier Zuikaku from December 1941 to May 1942, including at the Battle of the Coral Sea. In late 1943, Iwamoto's air group was sent to Rabaul, New Britain, resulting in three months of air combat against Allied air raids. Subsequent assignments were Truk Atoll in the Carolines and the Philippines, being commissioned an ensign in October 1944. Following the evacuation of the Philippines, Iwamoto served in home defense and trained kamikaze pilots. As a result of the Japanese use of the British naval practices, the IJNAS scoring system was based on the system the Royal Navy and the Royal Air Force (RAF) adopted from World War I until World War II. This system differed from the scoring system used by some other nations during World War II. Research by academics surnamed Izawa and Hata in 1971 estimated his score at about 80 or more than 87. In December 1993 Izawa wrote that Iwamoto was virtually the top ace of the IJNAS. As of mid-1944, there remained only two IJNAS fighter pilots who were credited with over 100 victories. 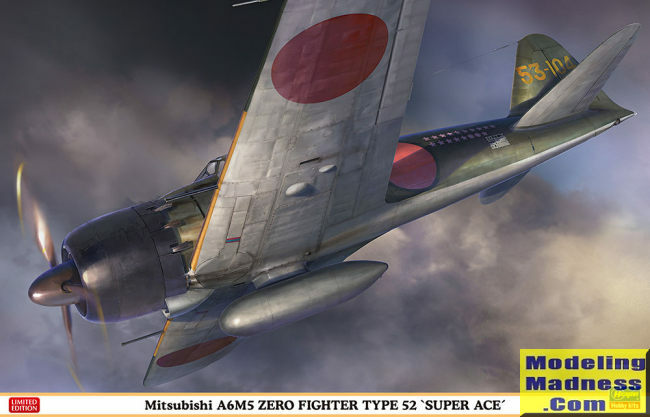 Depending on various totals cited, Tetsuzō Iwamoto or Hiroyoshi Nishizawa was Japan's top ace. Iwamoto was known as the Chūtai leader (Flying Company, squadron of 8 to 16 fighters). Iwamoto was one of few survivors of the IJNAS from the early part of the Second World War. He fought over the Indian and the Pacific Ocean from north to south, and trained young pilots even in the last months of the war. Like many Japanese veterans, Iwamoto was reported to have fallen into depression after the war. His diary was found after his death, with claims of 202 Allied aircraft destroyed. It was with some surprise that I learned of a new tool 1/32 Hasegawa A6M5 kit. A reader had been working on one and commented on how nice it was. While I'm not a huge builder of 1/32 planes, I knew that the Tamiya kit was quite pricey so looked into this one. My initial impressions are quite positive. Hasegawa has basically taken their excellent 1/48 offerings and used those as a basis. The larger scale provides a lot more room for detail and it has not gone to waste. The Japanese like to have pilots for their planes and this one includes a very nicely done one with two different head options; one has an oxygen mask. The sidewalls are separate items and all of the various boxes and levers are provided to attach to them. 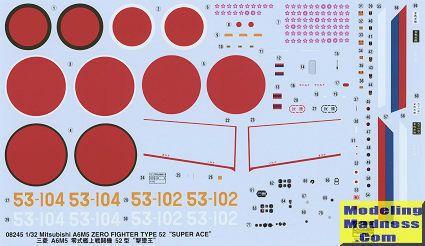 Decals are provided to go over any instruments on these panels as well as on the main instrument panel. Each of the nose machine guns consists of five parts, making them mini-models in their own right. The seat assembly is also very nicely done. Once all the bits are attached to the floor, all the various pieces come together in a bit of a cage to get ready to install in the fuselage halves. Hasegawa has included some bulkheads to help keep the fuselage properly aligned. These are similar to what you see in current large ship kits. The tail gear has to be installed when putting together the fuselage and if you are going to do an in-flight option, some trimming will be needed. A nice touch is that the cockpit installs from the underside of the fuselage so you could assemble the fuselage and the interior at the same time if you wished. 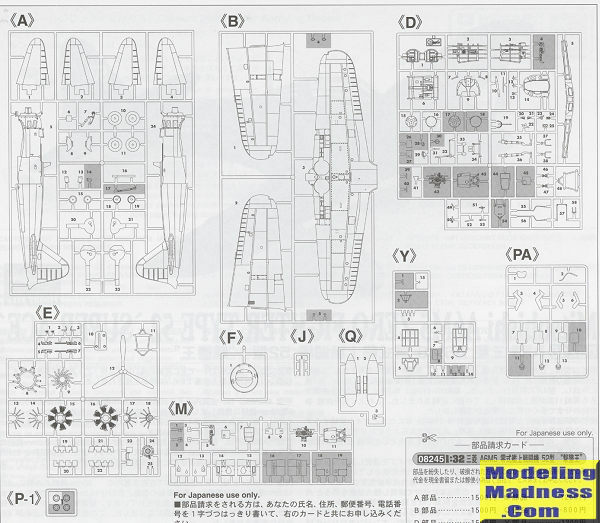 Hasegawa is able to produce the myriad variants by including inserts and this kit is no exception. There are three on the forward fuselage and four on the wings. This latter item is for the various armament differences. Before joining the upper wing halves to the lower section, one builds up the wheel well. The back wall of the well also serves as a nice, stiff wing spar. Tailplanes, once assembled, interlock with each other. This kit represents a land based plane so one does not install the tail hook, a plate being provided for where it would normally go. Landing gear is very nicely done and the kit even includes brake lines to attach to the gear leg and wheel hub. The inner main gear doors have the usual retraction braces. I found it interesting that the instructions call for the wells and inner gear doors to be painted grey-green primer, though the painting guide simply calls it green. The boarding step needs holes drilled if you are installing it and there is a guide. The engine is superbly done with both banks provided. Each has a separate push rod tube piece to install. A complete intake and exhaust piping assembly is provided as well. The engine cowling is mostly one piece with the option for either open or closed cowl flaps. A polycap is hidden in the engine gear box and the prop is pused into place once done. The prop assembly is a spinner front, full three blade prop piece and a backing plate. There is a separate windscreen, canopy, and rear section so you can model the canopy open. It would be a shame to hide all the interior detail, but if you choose closed, note that the plastic is very clear. Instructions are excellent and provide the usual Gunze paint references. The two markings options are planes flown by Iwamoto when stationed at Rabaul in early 1944. The two options differ slightly. The box art plane has the white surround to the Hinomaru painted out and has a lower victory score. The other one has the standard surround and larger score. Note that both white and yellow tail numbers are supplied as the exact color is not known. Decals are superbly done and I have no idea what the red, white, and blue stripes are supposed to be for. The instructions state "Decals without placement instructions can be used freely". OK. Decals are very nicely printed and provide what few stencils these planes carried as well as prop warning stripes. I should mention that though the instructions tell you to paint the interior with Nakajima green, the lower color of the plane is straight as in Mitsubishi built aircraft. From my understanding, Nakajima built planes had this color swoop up to the underside of the tailplane. Not sure this really matters, but there it is. Well, I'm impressed. It looks like you get a very nice kit for your money on this one. Perhaps not quite up to the standards of the Tamiya kit but I've not seen or built that one. One thing I do know is that you can get this one for well more than half the price and I'm betting it builds almost as well.